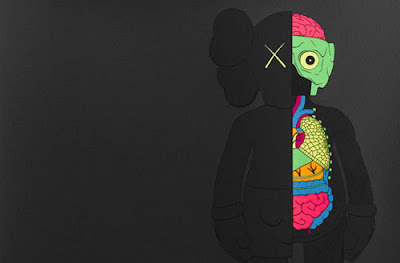 Kaws recently completed the third and final silkscreen in the Original Fake Companion series. The print above is signed and numbered edition of 100pcs. After the printing was finished and the paper was cut down to size the edges were hand painted with a neon pink to give a glow all around the print. The print went on sale on Saturday and may already be sold out. But if you still want one and have $700 to spend, head over to KAWSONE website. Check his blog to see some more pictures of the prints with the pink edges.